We provide an overview of a transdisciplinary project about sustainable forest management under climate change. Our project is a partnership with members of the Menominee Nation, a Tribal Nation located in northern Wisconsin, United States. We use immersive virtual experiences, translated from ecosystem model outcomes, to elicit human values about future forest conditions under alternative scenarios. Our project combines expertise across the sciences and humanities as well as across cultures and knowledge systems. Our management structure, governance, and leadership behaviors have both fostered and constrained our work and must be continuously responsive to changing group dynamics. Our project presents opportunities for substantial contributions to society, including insights and knowledge about complementary ways of knowing, skills training, and professional development, and opportunities for reflexive learning about effective transdisciplinary, translational, and transformative scientific processes. Our project is made possible from an award from the National Science Foundation Coupled Natural Human program (Award BCS#1617396). Reflections and recommendations herein are the responsibility of the co-authors only. Angal, J., Petersen, J. M., Tobacco, D., Elliott, A. J., & Network, P. (2016). Ethics Review for a Multi-site Project Involving Tribal Nations in the Northern Plains. Journal of Empirical Research on Human Research Ethics, 11, 91–96. https://doi.org/10.1177/1556264616631657. Dockry, M., Hall, K., Van Lopik, W., & Caldwell, C. (2015). Sustainable Development Education, Practice, and Research: An Indigenous Model of Sustainable Development at the College of Menominee Nation, Keshena, WI, USA. Sustainability Science, 11(1), 1–12. https://doi.org/10.1007/s11625-015-0304-x. Duveneck, M. J., Scheller, R. M., White, M. A., Handler, S. D., & Ravenscroft, C. (2014). Climate Change Effects on Northern Great Lake (USA) Forests: A Case for Preserving Diversity. Ecosphere, 5(2). https://doi.org/10.1890/es13-00370.1. Enquist, C. A. F., Jackson, S. T., Garfin, G. M., Davis, F. W., Gerber, L. R, Littell, J. A., et al. (2017). Foundations of Translational Ecology. Frontiers of Ecology and the Environment, 15, 541–550. https://doi.org/10.1002/fee.1733. Morse, W. C., Nielsen-Pincus, M., Force, J., & Wulfhorst, J. (2007). Bridges and Barriers to Developing and Conducting Interdisciplinary Graduate-Student Team Research. Ecology and Society, 12(2), 8. 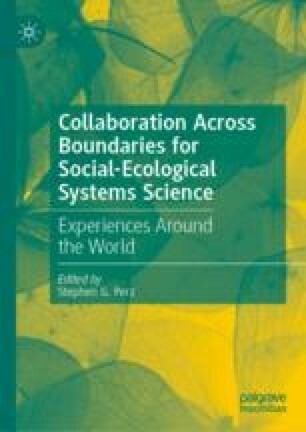 [online] url http://www.ecologyandsociety.org/vol12/iss2/art8/. Palosaari, N. (2016). Intellectual Property Rights and Informed Consent in American Indian Communities: Legal and Ethical Issues. American Indian Law Review, 41, 125. https://digitalcommons.law.ou.edu/ailr/vol41/iss1/4.